Rosenbaum Contemporary will be exhibiting Voices of HOPE: Celebrating Robert Indiana, including recent works by this renowned American painter, sculptor and printmaker. From September 11, 2013, to May 30, 2014, the exhibit will run the full length of the long-awaited retrospective at the Whitney Museum of American Art as well as the upcoming Indianapolis Museum of Art exhibit and opens with a reception from 6 to 9 p.m. on Sept. 11 in celebration of the artist’s 85th birthday which is taking place that week on Sept. 13. The exhibit will highlight Indiana’s iconic HOPE series, which has inspired a new generation of American identity, as his memorable LOVE piece had during the tumultuous 1960s. Among the selected works are pieces featuring his innovative use of blending color spectrums, as well as the bold, latticed HOPE Walls, all illustrating the re-wording of his work and reworking of himself as an artist. Indiana's works are in the permanent collections of the Museum of Modern Art, New York; Whitney Museum of American Art, New York; Metropolitan Museum of Art, New York; Stedelijk Museum, Schiedam, The Netherlands; Carnegie Institute, Pittsburgh; Delaware Art Museum, Wilmington; Detroit Institute of Art, Michigan; Baltimore Museum of Art, Maryland; Brandeis Museum, Waltham, Massachusetts; Albright-Knox Gallery, Buffalo, New York; San Francisco Museum of Modern Art, California; the Hirshhorn Museum in Washington D.C.; Institute of Contemporary Art, University of Pennsylvania, Philadelphia, Pennsylvania; the Indianapolis Museum of Art, Indiana; and the Los Angeles County Museum, California, among many others. 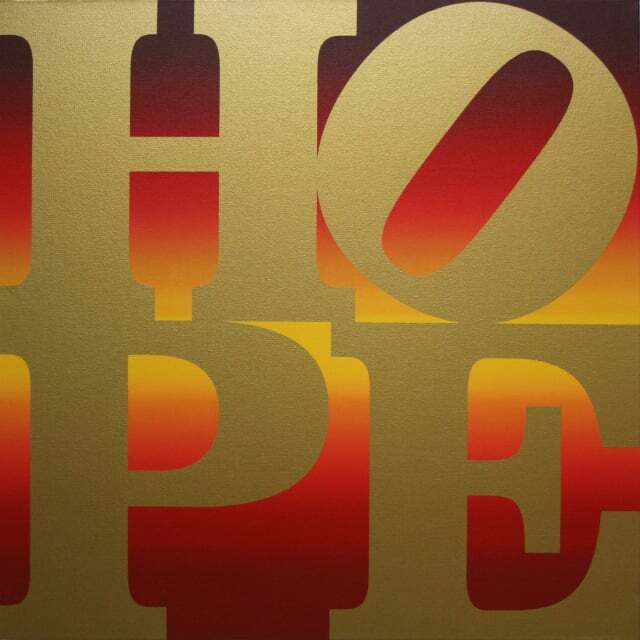 Voices of HOPE: Celebrating Robert Indiana, curated by Howard Rosenbaum and Daniella Sforza, a tribute to this seminal Pop artist, is also opening on a day our nation can use renewed hope: Sept. 11. In yet another resurgence of recognition for his prolific work and on the cusp of becoming an octogenarian, Indiana gave us that HOPE with his series initiated in 2008 and represented by Rosenbaum Contemporary since its inception. In bringing us HOPE, Indiana continues his use of bright colors, clearly defined hard edges, simple formal configurations and monosyllabic words to serve as signposts pointing us to observe American issues and topics, including the socio-political. As a self-defined “sign painter,” Indiana has had his finger on the signs of our time as a modern nation. This is true no less so today as he continues to inspire us with his poignant, and, at the same time, simplistic words; bare, vowel-filled and as basic as the sound of our breath exhaling: LOVE – HUG – EAT - PEACE – HOPE – DIE - ART, in a never-ending cycle of life fulfilled, circling round in much the same manner as that ever leaning forward “O”. September 11, 2013 to May 30, 2014. Opening reception Sept. 11, 2013 | 6:00p.m. – 9:00p.m.